As interactive video continues to grow in popularity amongst both brands and consumers, many companies are exploring how to add it into their marketing mix. And it makes sense; viewers watch interactive video ads 47% longer than linear video ads, giving you much more bang for your buck than traditional, static videos. If you haven’t started thinking about how to use interactive video to reach your marketing goals, there’s no time like the present. The best part: you don’t have to be a video production pro to make your videos interactive. There are several online tools you can use to add interactive elements to your videos. We took the time to review fourteen of the most popular interactive video software companies so you don’t have to. Before we dive into the different companies, let’s quickly outline what interactive video is and how you can use it. Put simply, it’s a more engaging type of video media where viewers can click on and interact with content directly within the video itself. The most popular interactive features include hotspots, cards, multi-screen viewing, 360-degree viewing and branching. These videos come with a lot of benefits; mainly, they give the viewer the ability to customise the video content they see for a highly personalised experience. This choose-your-own-adventure style approach uses gamification techniques to make video watching more fun and highly dynamic for viewers. If you’re looking to create your videos in-house, you can choose from several different video software tools to add interactive elements to your videos. These platforms allow you to manipulate your existing video content to add features like branching, hotspots, shopability and more. Learning how to use interactive video software can become a full-time job. That’s why many companies choose to partner with an agency that can manage the process for them. Luckily, there are several high-quality video agencies who can translate your visions into realities. If you decide to go that route, read our recent blog post, “How to Choose an Interactive Video Company,” for tips on finding and selecting the right partner for you. If you decide you want to explore a DIY approach, we’ve made it easier for you by reviewing 14 popular interactive video software companies. Each comes with a different set of features and functionalities at different price points. Read below to see if one of these options is right for you. Wirewax is a tool that allows you to use hotspots, branching, camera switching, 360-degree experiences, slider views and more in your videos. As you can see, the biggest benefit of Wirewax is its broad capabilities; Wirewax empowers nearly every type of interactive video functionality being used today. However, that functionality comes with a price tag. Wirewax is one of the more expensive platforms available. The company offers two different pricing models for businesses: monthly pricing at $1,500 to $50,000 per month, dependent on the features you need to utilise; and $7,500 to $500,000 if you want to use Wirewax for a single campaign only. HapYak is a video SaaS platform that allows you to layer interactivity onto your video. With HapYak, you can add links, e-commerce functionality, quizzes, slide show presentations and more to your videos. The biggest key differentiator HapYak touts is their built-in analytics tool. The platform uses an API to connect viewer clicks and behaviors with popular marketing and CRM tools, helping you track your video metrics from a bird’s-eye perspective. HapYak’s pricing model is a monthly subscription ranging from $500 to $4,700 based on your company’s needs. Rapt is a holistic cloud-based tool that allows you to easily create, embed and analyse interactive videos. Their editor, Composer, uses simple drag-and-drop actions to add clickable elements and branches to your videos. Then you can embed your videos almost anywhere you can put HTML, including your website, blog or app. Finally, use Rapt’s robust analytics dashboard to track and improve your videos over time. Rapt work through partner companies so you’ll need to find the most suitable partner for your needs and contact them. Adventr is an easy-to-use tool that allows you to drag-and-drop video clips to create branching effects. It’s an open platform, which means you can easily post your videos to social media platforms, web pages, ad networks and more. It also comes with a built-in analytics feature that tracks your viewing metrics across all the sites where your video is hosted. Adventr has a limited business use subscription fee of $99 per month, or custom enterprise packages for companies that need a more robust solution. Vizia is a platform that specifically integrates quizzes, polls and clickable CTAs in videos. While its feature set is somewhat simple, so is the user interface. Vizia is easy to learn and use, even for non-video editors. Vizia was built by Teachable, an e-learning platform that developed the software for their own educational videos; the company decided to make their video editing technology free to other businesses as well. 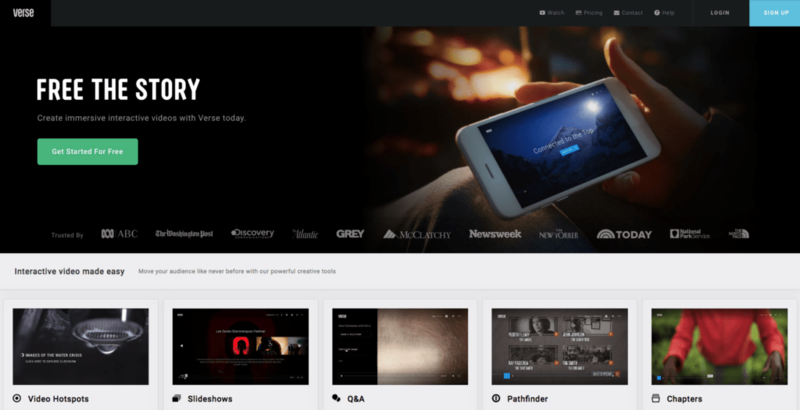 Verse is a well-rounded interactive video editing tool that allows you to add hotspots, branching, chapters, slideshows and even Q&A features to your videos. Verse also comes with a built-in analytics tool so you can track views and in-video interactions. Verse has a professional-use subscription service that costs $199.99 per month, and offers custom packages for businesses starting at $500 per month. Vidzor is an editing, publishing and distribution platform. It’s a one-stop-shop tool where you can both add interactive elements like hotspots, branching and more, and also host and share your final videos. Vidzor offers a free plan that comes with in-product ads and requires you to have a Vidzor logo on your video player; alternately you can upgrade for $99 per month for an add-free, logo-free experience. Eko, a video technology company, has a product called Eko Studio through which users can create branching video experiences that empower customised, user-driven stories. While the platform has a very intuitive user experience to create branches, if you’re looking for a tool that can create multiple kinds of interactivity, Eko may not be right for you. You can use Eko for free for both personal and commercial use. HiHaHo was created specifically for e-learning and educational purposes, and allows you to add questions during your video to quiz your audience throughout their viewing experience. HiHaHo also allows you to create an in-video menu that links to your website and other URLs. Because of its limited functionality, HiHaHo is more affordable than other tools on our list; HiHaHo costs $97 per month for one user, or $497 per month for multiple users. Multipop was specifically created to monetise video content, but can also be used to add popups with additional text and image content to your videos. The platform allows you to easily identify products in your video and link to e-commerce pages where viewers can make purchases. Unlike the other tools on our list, Multipop is based on a CPM pricing model, which means you pay based on the number of people who watch your video. Engajer is a tool where you can create interactive video content, distribute it and measure audience engagement. Engajer was built to be a branching platform, so while it allows users to easily create choose-your-own-adventure style videos, it doesn’t have any additional interactive functionalities. You can, however, integrate Engajer with several CRMs. For only a few users, you can access Engajer for either $49 or $150 per month, depending on your needs. For enterprise plan pricing, you should contact Engajer directly. Wootag is a self-service video tool optimised for e-commerce conversions. Wootag empowers your users to click on and buy product within your video, and tracks those clicks and conversions in their accompanying analytics tool. You can also add user polls to get custom feedback directly in your videos. Wootag has several different price options; it’s $25 per month for startups, $100 per month for business, and the platform offers customised pricing for enterprise companies. 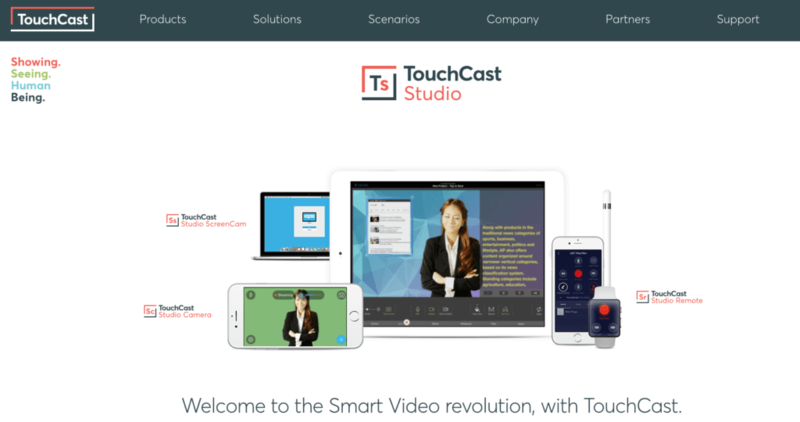 TouchCast is like most of the platforms we’ve mentioned above, with one key difference: the platform recently released live functionality, which gives you the ability to add interactivity to live videos like webinars and live product demos. This powerful feature means you can switch up content, optimize the viewer experience and engage your audience on the fly. For pricing information, you should contact TouchCast directly. Use dedicated software: You can try interactive video with a DIY approach and learn to use existing software like the ones listed above. While some brands choose this option, you should be prepared to spend a lot of time learning to use the platform you choose. Hire an interactive video agency: If you’re already strapped for time and wearing too many hats, you should consider hiring an experienced agency to produce your videos. With this option, you skip the hassle of learning complex software yourself, and can have peace of mind knowing your project is in the hands of seasoned experts. Regardless of the route you choose to take, we’ve prepared some additional resources to help you get started. Learn more in our free e-book, Getting Started with Interactive Video. It includes tips, tricks and next steps for making your first video a success.